This was a cooperative venture between Taveuni Dive Resort and Exploring Taveuni, a book published by Taveuni Adventure Media. All materials are copyright 2016 Taveuni Dive Resort and Taveuni Adventure Media. If Cozumel is Cayman on speed, then the Somosomo Strait is Cozumel on acid. Scuba diving in Taveuni’s waters earned its world-class reputation due to the Somosomo Strait. The Somosomo Strait is a narrow channel separating Vanua Levu and Taveuni. At every change in tides, water funnels through the strait, rushing along the reefs, providing nutrients and food to an unparalleled variety of marine life. This back-and-forth flow (incoming from the north, outgoing from the south) creates ideal conditions for lush soft-coral growth, providing dive sites like the Great White Wall, where Dendronephthya (the white soft coral earning the site its name) blankets nearly every inch of reef space. Conditions like these are relatively rare — it is uncommon for such a large volume of nutrient-laden seawater to be forced through a narrow, shallow passage suited to coral growth. The secret sauce of the Rainbow Reef. While only limited research has been performed in the area, scientists (many of whom are avid divers) are increasingly interested in ways to study and measure the unique environment of the Somosomo straits. Two recent examples included the Great Fiji Butterflyfish Count and the Great Fiji Shark Count. Butterflyfish are an important species for measuring comparative biodiversity because of their wide range across the globe, and their usefulness as an indicator species — butterflyfish populations are only large in areas where the ecosystem is healthy. Of the 116 known species of butterflyfish and bannerfish, at least 27 species of butterflyfish and 6 species of bannerfish are present in Fiji. Counting results observed 100% of the species known in Fiji to be present in Taveuni’s waters. Results from the Great Fiji Shark Count suggest that almost 800 sharks were observed on the last census, averaging 1 shark per dive. A total of 5 species were recorded in Taveuni’s waters, including whitetip reef sharks, tawny nurse sharks, leopard/zebra sharks, blacktip reef sharks, and grey reef sharks. Other species, such as scalloped hammerheads have been observed, but not as part of the shark count. This short section provides common information you should remember during the dive briefing and pre-dive checks. We’ve all seen this material, but it won’t hurt to see it again. Disclaimer: consider this a helpful reminder of the things you learned in your certification classes. This section is no substitute for being a knowledgeable, fit, and properly trained diver. Before you travel, make sure you obtain dive accident insurance. We’re big fans of DAN, check out their website. DAN offers very affordable dive accident and travel insurance for divers and their families. This includes coverage for emergency evacuations (including non-dive accidents). In addition, DAN has excellent resources on dive first aid and care. Be sure you pick up one of their excellent first aid kits and resuscitation masks. This section briefly covers a number of topics to help prevent problems, and provide recent guidance in responding to issues that can arise in the waters of the tropical pacific. These include use of exposure suits, first aid for common marine injuries, and diver behavior. Medication — the first topic to address is the combination of medications and diving. Be sure to check with your doctor prior to traveling and diving while on medication. Be aware of potential side effects or issues that may arise. Don’t dive without the concurrence of your physician. Wet suits — while the water temperatures in the waters of Taveuni range from 20 to 26°C, divers should consider wearing a wet suit for protection. With the currents at several of the Rainbow Reef dive sites, a wet suit provides a layer of protection against cuts and abrasions caused by accidentally brushing against coral and rock. Wet suits and booties also reduce damage caused by inadvertently touching, stepping on, or swimming into certain aquatic life. Most dive operators provide rental 3.5 mm wet suits, which are thick enough for protection, but do not overly restrict movement. Most vessels allow for deep-water entries using the backward roll or giant stride. After entering the water, remember SORTD – your five-point descent: 1) signal, 2) orientation, 3) regulator, 4) time, and 5) descend. Do not harass marine life. If you get lost or separated from your buddy or dive group, look around for one minute and safely ascend to the surface. If your group notices a diver has become separated from your group, then look for the missing diver for one minute, then safely ascend to the surface. Stay at the same depth as the dive leader, obeying safety limits presented in the dive briefing. Relax and swim slowly. Many of the dives in Taveuni’s waters are drift dives. Slowing down will allow you to experience a better dive and use less air. Prior to ascent, remember STELA: 1) signal, 2) time, 3) extend, 4) look up, and 5) ascend. Complete your safety stop – safely ascend to a depth of 5 m and remain there for the full three minutes. After your safety stop be sure to surface slowly, watching for overhead hazards (like a boat). Upon surfacing, signal that you are okay. Wait for the boat to approach you. For safety reasons, most captains will leave the boat running, but out of gear, during boarding. Hand your fins and weights up to the crew aboard the boat. Board the vessel, watching for pinch points. Buoyancy Compensating Device (BCD) — check that your BCD properly inflates and is in good condition. Verify that the oral inflator is functional. Weights — check that your weights are appropriate and securely installed. If using a weight belt, verify that you have the belt oriented for a right hand release. Releases — are the releases and buckles on your equipment functional and in good repair? Air — breathe from the 2nd stage and alternate air source in order to assure that your air pressure is turned on. Verify the reading on the submersible pressure gauge. Final Okay — get your mask, fins, and one last final check. We divide the dive sites into 3 categories: Wall, sloping reef with pinnacles and sloping reefs. Likely the most popular dive site in the Rainbow Reef is the Great White Wall (a perpendicular wall covered in ice colored soft coral, below 15m/45ft). Due to tidal conditions, we dive the Great White Wall only a few days each month, so check the schedule). Other popular wall dives are the Purple Wall, the Zoo and the Fish Factory. A map of our most popular dives is shown below. Dives with sloping reef with pinnacles (bommies) include the famous Annie’s Bommies and the Mini White Wall. Well-known slopping reefs are Jerry’s Jelly, Sam’s Point, Fish Factory, and Rainbows End. Many of the dive sites make ideal snorkel sites and we often get lucky and have slow, gentle drift snorkeling! Our favorite sites for snorkeling are Nuku Reef, Fish Factory, and Cabbage Patch. Due to the rich flow of nutrents, the amount of reef life you see on every dive or snorkel will amaze you! The most common reef fish we see include butterfly and angelfish, trigger and parrotfish, fusiliers, anthias, wrasses, groupers and of course plenty of clownfish. Remember –– fish families have many different species. We typically see 3 or 4 different species include clown fish. Other interesting sea life we see include giant clams, eels, nudibranchs, flatworms, dolphins, octopus, turtles, sharks, and rays. A map of popular dive sites in the Somosomo Strait. This is a wall dive with coral on top. Marine life includes barracuda, moray eels, manta rays, potato cod, fusiliers, basslets, anthiases, sharks (usually in schools), nudibranchs, plus lots of small beautifully colored fish. There are a large range of soft coral and flatworms. The average visibility at the Zoo is 20 – 24 m, depending on the time of year. This dive is best seen on a falling tide. Here is a link to Scott Putnam's video of the Zoo at FijiGuide. Below is a map of the dive. This dive starts as a sloping reef turning into a wall. Marine life includes schools of barracuda, leopard shark (very occaisionally), and many hard and soft corals. This site has an outer wall with a reef top starting at 6 m, dropping away to about 60 m. The wall is covered with purple soft corals, sea whips and large gorgonian fans. Marine life includes a variety of pelagic species ranging from barracuda to jack trevally, mackerel, sea fans, and variety of nudibranchs, anthiases, fusiliers, basslets, whitetip reef sharks and occasionally, manta rays. The best time to dive this site is on a falling tide. The Great White Wall presents the diver with a spectacular opportunity to experience diving at a depth missing in most other sites at Fiji. The diving is special; you can watch the dive on Vimeo. Below are pictures of the dive site and a dive map. If conditions are right for the dive, the trip down the swim-through will bring you face-to-face with soldierfish, squirrelfish and fairy basslets. A lot depends on hitting the site at the right times for the current and tidal changes. Prior to descent, you may look down and see sharks swimming at a depth of approximately 18 m. The dive begins with a descent to a tubular cave starting at 15 m deep. This swim-through is coated in hard and soft corals, as well as colorful sponges and crinoids. There may be a few resident lionfish and morays greeting you as you cruise along. There is a neat window along your descent through the cave. Once you file through this cave towards the exit at 25 meters and turned left, you end up along the white wall proper. This wall is blanketed with white soft coral (Dendronephthya). Between the white coral are little splashes of orange, green and red but the overall effect is undoubtedly that of a great, white wall. As you back off the wall, it becomes electric blue. Square-spot anthiases seem to be the pre-dominant fish on the wall as they dash around against the white backdrop. However the wall itself, with its white blanket, several whip corals playing home to gobies and a few large gorgonians, is the undoubted star attraction. Photography Note: Most divers spend time right against the wall. To really capture the immensity of the site, try backing off the wall. The wall plummets dramatically into the abyss — and you will too, so besure to watch the divemaster and mind your SPG (for this dive it is difficult to monitor depth using points of reference). One interesting change is that with depth the wall becomes iridescent purple. If conditions permit your guide may also lead you through an additional swim-through, which is home to soldierfish, squirrelfish and fairy basslets. This location is unique, making it one of Fiji's signature dive sites. Annie’s Bommie is a submerged reef with big bommies allowing divers to weave between them. The site name refers to several large conical pinnacles rising from the seabed that characterize this dive site. In many ways Annie's Bommie is typical of the diving in the Somosomo Strait. Marine life includes schools of fusiliers, basslets, anthiases, jack trevally, moray eels, occasional leopard sharks, stingrays and pipefish. The area is covered in soft coral and hard coral on top of bommies, including opal bubble coral. When diving here, you will notice a marked difference depending on the strength of the current. Without current it is pretty and there is a plenty to see. When the current runs, it is an almost violent affront to the senses, bursting with floral beauty. The marvelous color of the scene can't be overstated. Annie's bommie may not feature a dramatic wall, but it is a great spot to take your time and investigate the nooks and crannies, weaving through the bommies and taking a breather when sheltered from the current. At these times you can leisurely explore for small things like nudibranchs, gobies and pipefish. All the while it is worth keeping an eye out for leopard sharks resting on the bottom, perhaps in the company of blue-spotted rays, and you are always likely to see the gaping mouths of morays protruding out from their sheltered holes. A common dive route at Annie’s Bommie is shown below. Located at the tip (Corner) of Annie's Bommie, this dive site is a great place to see a variety of organisms. Marine life includes clown triggerfish, unicorn fish, anemonefish, fusiliers, surgeonfish, sea whips, nudibranchs and flatworms like the Spanish dancer. Occasionally schools of sharks and barracudas are present. In addition there is a large variety of soft and hard corals, including sea fans. A map of the dive site is presented below. This site is a submerged reef with a short section of wall. The segment is approximately 36 m2 covered with mostly the white soft coral seen on the Great White Wall (Dendronephthya). There are a variety of other soft corals. Marine life includes stonefish, snapper, and leopard sharks, plus a variety of nudibranchs. Wise’s Place has depths ranging from 8 – 25 m. The topography is a sloping reef covered in coral heads. Marine life includes schools of coral grouper, fusiliers, lyretail anthias (sea goldies), blue-spotted stingrays, and yellow-margin moray eels. In addition there are large star corals, table corals, fire corals, flower corals, and white soft corals. Jack’s Place is another sloping reef, with depths between 8 – 18 m. Lots of hard corals mixed with soft corals and beautiful colors. Marine life includes schools of powder blue surgeonfish, triggerfish, giant wrasse, and yellow margin moray eels. Potluck ranges between 8 – 27 m in depth. The site is a sloping reef that meanders around three large bommies. Marine life includes schools of trevally, bronze whaler and whitetip reef sharks, schools of red snapper, eagle rays, and lots of hard corals. You can see the ocean floor here from the surface as you enter the water. On descent, the fish congregating around the coral heads may greet you. A large school of jack trevally is often present facing into the mild current. Smaller schools of sweetlips and barracudas may also be present. The dive proceeds drifting with the current towards the north (as conditions permit). The sloping wall on your right shoulder drops to a sandy, sloping bottom at 30 m, rising to a height varying between 10 – 15 m. The slope features healthy coral coverage, mostly in the form of staghorn and table coral, with a number of giant clams and fans also present. When you dive these waters, you should look for the unusual sight of parrotfish in large numbers, effectively schooling as they swarm the slope, munching hard coral and then excreting it in puff of fine sand that slowly descend to the sea floor. Interestingly these groups consist of both blue-green and purple parrotfish! Fish Factory is a wall with depths ranging from 6 – 27 m plus a variety of soft coral on the top and side of the wall. Schools of parrotfish, humphead parrotfish, Spanish mackerel, angelfish, trevally, cod, moray eel, occasional manta rays, occasional sharks, stonefish, and leaf scorpionfish. Nuku Reef is a sloping reef dive, with depths between 6 – 21 m. Marine life includes soft and hard corals, triggerfish, clams, Christmas tree worms, leathery sea anemone, and lots of small beautiful colored fish. While it is typically used as a second dive, don’t underestimate its quality. Nuku reef is a fun place to visit. Check out Scott Putnam’s video of the dive site over at Fijiguide. The Carl Street dive site has depth ranging between 8 – 27 m. It has a sandy bottom with a number of small bommies or coral heads. The dive weaves between the bommies, and then drifts along a sloping reef to the right. The drift takes you by a number of hard and soft corals. The Ledge (Level 3) is a submerged reef with depth ranging from 8 – 40 m, which has a ledge at 12 m all around the reef with a variety of soft coral and sea whips. Marine life includes emperor angelfish, clown triggerfish, titan triggerfish, flat worms, and a couple of lionfish are often seen hovering over the side of the ledge. Jerry's Jelly is a sloping reef with depths ranging from 5 – 18 m. Two pinnacles with white soft corals under a ledge are visible near the top. Marine life includes schools of somber sweetlips, lots of colorful small fish, and garden eels. A map is presented below. The dive begins by dropping down to 18 m with the reef on your left shoulder. If the current is of medium strength you can cover a reasonable distance along this reef, finning only gently to maintain your position. Large numbers of garden eels rise up from their burrows to feast on the nutrient rich water rushing past their front doors, and retracting if you get too close. As you continue your drift, keep a look out for Spanish mackerel, dogtooth tuna and whitetip reef sharks as well as large numbers of nudibranchs. Eventually your dive crosses over the reef flat before dropping into the lee of the other side of the reef, sheltering you from the current. The speed of the crossing is breathtaking as you glide over the flat. Then as you edge slowly into shallower water, the current strengthens. 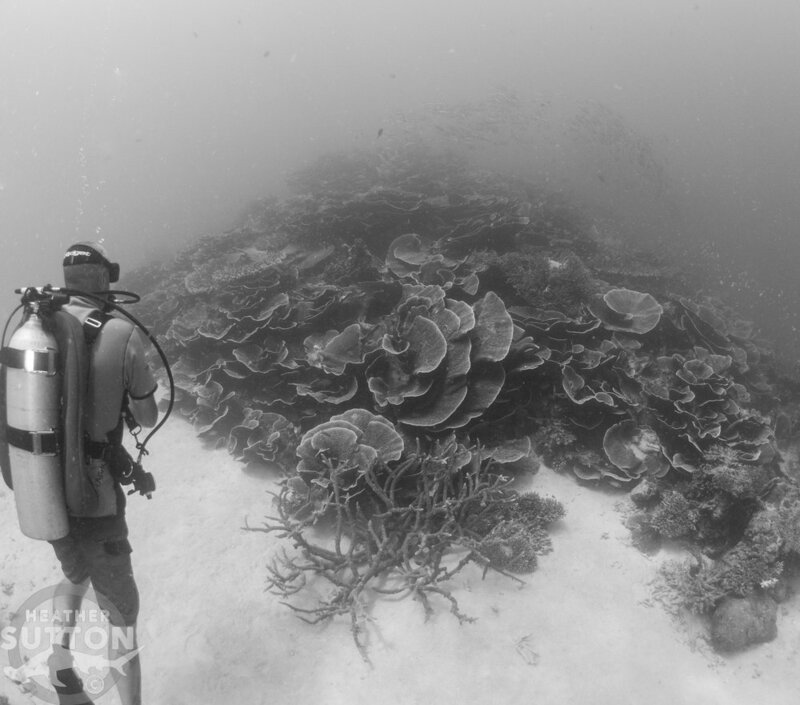 The top of the reef is at about 6 m (slightly too shallow for your safety stop). The safety stop begins when all the group gathers, then let go and drift with the current. Sam's Point is a dive on a sloping reef with depths from 3 – 27 m, although this site is mainly done as a second dive at a maximum depth of 18 m. Lots of soft coral, and sea fans. Marine life includes humpback snapper, schools of small fish, coral grouper, white tip sharks, and blue ribbon eels. Rainbow's End I is a sloping reef dive with depths between 8 – 24 m. The dive presents a number of soft corals in various colors and a variety of marine life. The dive starts with a drop from the surface to 15 meters, with the sea floor usually visible from the dive boat. As with all dives in the Somosomo Strait, the direction and strength of the current will determine your plan. The dive plan normally consists of gentle drifting along with the sloping reef to your right shoulder. The slope is decorated with table corals and other varieties of Acropora, as well as boulder corals and porites, usually playing host to boring clams and Christmas-tree worms. Life here is more typically numerous individuals rather than schools, so you can spot parrotfish, red-breasted wrasses, emperor and blue-girdled angelfish, Napoleon wrasses, long nose butterflyfish, and Moorish idols. More numerous are the red-tooth (vampire) triggerfish and both blue streak and blue & yellow fusiliers. In the sand you can look out for blue ribbon eels, as well as gobies standing guard while their shrimp partners take care of the housework. Rainbow's End II is a continuation of the same dive as Rainbow’s End I, and the start is dependent upon current speed and direction. Yellow Tunnel ranges in depth between 9 – 24 m. This sloping dive culminates in a drift around a large coral head. Near the outside of the coral head is a swim-through covered in yellow soft corals inside and outside of the tunnel. Marine life includes stonefish, whitetip reef sharks, schools of bicolor parrotfish, and many colorful small fish. Barracuda Hole ranges in depth between 6 – 24 m. The dive is a drift along a sloping reef that passes two coral pinnacles. Marine life includes schools of barracuda, jack trevally, unicorn fish, fusiliers, bronze whaler sharks, whitetip sharks, sometimes nurse sharks, and nudibranchs. Cabbage Patch is a sloping reef dive with depths ranging between 3 – 18 m, ending along a huge outcrop of serpentine salad coral. While the coral is the big draw, look out for unicorn fish, arc-eye hawkfish, Achilles tangs and scalefin anthias; and the occasional banded sea krait. When you're diving in Taveuni you may, if you are in luck, come across the bicolor fang blenny. This is a long yellow blenny endemic to Fiji and can be seen striking at other small fish entering its territory. On the sandy areas watch for pairs of fire dartfish, shrimp and goby partnerships, and sea cucumbers such as Thelnota anax and Bohadschia graeffei (the one with the black frilly tubercles stretching out from its front end on to the sea floor). This dive is best seen on a falling tide. Here is a link to Scott Putnam's video at Fijiguide.